A circular walk from Clapham in the Yorkshire Dales. The walk heads out along Thwaite Lane, an ancient track past Robin Proctor's Scar towards Norber. After a short climb, the Norber Erratics are reached. There are numerous 'erratics' strewn across the field. The large silurian rocks were moved by ice during the ice age and deposited 'out of place' in the limestone. The walk then heads back in front of Nappa Scar as it returns to Clapham. Parking: National Park Centre car park in Clapham (grid reference SD 745 691). Turn right out of the National Park car park. Follow the road towards to the church, taking the lane to the right-hand side of it. The lane immediately passes in front of the entrance of Ingleborough Hall, then bends to the left down the right-hand side of the church. The track then passes under two bridges, before starting to climb through some trees. As the path levels, a 'T' junction is reached. Continue straight on following sign "BW Austwick 1½ miles" along Thwaite Lane, an ancient middle ages track connecting Fountains Abbey and Lancaster. Turning left at this signpost would lead down Long Lane and eventually on to Gaping Gill and Ingleborough. Contining straight ahead along the now level Thwaite Lane, layers of limestone can be seen to the left, which form Robin Proctor's Scar. The scar is named after a farmer from Crummockdale, who liked his drink and was habitually brought home safely each night from a local inn by his trusty horse. Unfortunately, one winter's night, he had one too many and got onto the wrong horse to bring him home. Needless to say, the horse not knowing the route home continued onwards along the lanes until eventually it went a little too far over a cliff and killed them both. Continue along the lane for just under a mile, with views of the limestone scar on the left and views across to Burn Moor and the Forest of Bowland to the right. Then go over the ladder stile on the left of the lane, following the footpath sign for Norber. The path leads across a field, heading for the far right-hand corner in the direction of the scar. Upon reaching the wall, follow the path around the left-hand side of the wall, as the wall bends around under the scar. Continue along the path for about fifty yards under the scar, and over another ladder stile. Again continue ahead for another two hundred yards where the wall bends around to the right. Leave the wall and continue on in the same direction heading uphill towards a signpost a further fifty yards up on the horizon. From here there are views straight ahead into Crummack Dale. Here take a detour left following the sign for Norber. Climb a short steep hill, where the erratics start to appear as the path levels. Continue ahead and a few yards further take the right-hand fork as the path splits to head up towards a cairn about a further hundred yards ahead. The path bends around to the right and passes below the cairn to reveal further numerous erratics strewn across the field. During the Ice Age, ice moved these Silurian rocks from neighbouring Crummockdale and deposited them on the limestone. 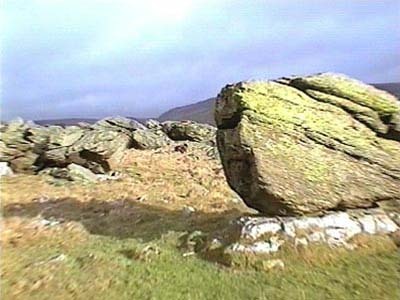 These out of place rocks are known as erratics. Over the years the limestone under many of these boulders has been protected from the rain by these Silurian boulders, and plinths have been formed as the rest of the limestone around the boulders has been eroded. Return back down the hill to the signpost. Follow the sign to the left signed Crummack, and continue across towards the wall through further boulders. The path gets within a couple of yards of the wall and continues up the short steep slope by the side of the wall. As the path starts to flatten, go over the stone stile built into the wall, and head slightly diagonally left downhill across a small field to go over another stone stile in the wall. The path then follows in front of the cliffs of Nappa Scar and then alongside a wall down to the corner of the field. As this field is crossed, the lane, which is visible down to the right, is part of the route home. Go over a ladder stile in the corner of the field and turn right into this lane (Crummack Lane). Follow the lane down into the dip, where there is an excellent view back up to Nappa Scar with a waterfall beside it, whilst several erratics decorate the skyline. Continue on the lane up the hill. As the lane starts to flatten, turn down the first track on the right-hand side back into Thwaite Lane, following the sign "BW Clapham 1½ miles". Follow this track all the way back into Clapham again passing under the two tunnels. Upon reaching the road by the church turn left and follow the road for two hundred yards before turning left back into the car park.